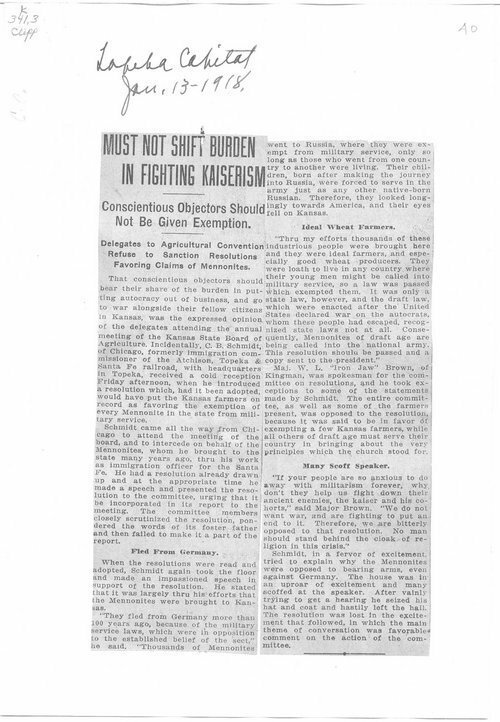 This article published in the Topeka Capital addresses the decision by the Kansas State Board of Agriculture to deny Kansas Mennonites status as Conscientious Objector exempting them from service in World War I. Included in the article is arguments by C. B. Schmidt who supports the granting of Conscientious Objector status to Mennonites. This article can be used to introduce students to the pro vs. con arguments in favor of granting Conscientious Objector status to Mennonites in Kansas. Call Number: K 341.3, Clipp., v.1, p. 1-123, Sedition, espionage, etc.